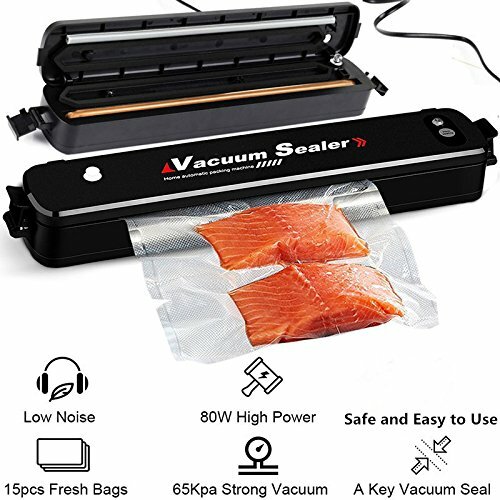 ★ 2 in 1 Multi-functional Vacuum Sealer: automatic one touch vacuum seal mode and manual seal mode suit for vacuum packaging and general SEAL packing, More powerful vacuum machine, easily remove the air from bags in few seconds. Easily sealing food and non-food items,such as photos, Jewelry, antiques, important paperwork and more! ★ Safe and Easy to Use: Double capacitance overheat protection and noise reduction technology, no smoke, no safety worries. Hand free design, Intelligent LED indicator lights to show you the status of the sealing process. Automatic One-touch vacuum sealer operation, easy to use. Vacuum speed 5-8 seconds, save your time. Sealing place fast cooling, will not be hot, no burn smell, safer for you. ★ Portable & Durable: Lightweight and compact design, portable for home and outdoor usage. Durable premium ABS material, easy to clean, energy saving, low noise, antibacterial, moisture-proof, antioxygenation vacuum sealer machine, a must have assistant for sous vide cooking and home essential. Fresh food comes at a price, but not with this device.